A month ago,i came across this brilliant article by Phil Ball,on the power and rise of the media punta. He explains the reasons behind its importance and states that with an abundance of media puntas,Spain can dominate the world in the years to come. 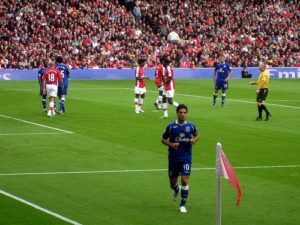 In that article Ball mentioned that,Arsene Wenger was the only manager in England who tried to introduce the Media Punta and in Cesc Fabregas and Samir Nasri,Arsenal had two of the best in the business.When they lost them both in the summer,Wenger bought Mikel Arteta from Everton.So can Arteta play between the lines as Fabregas and Nasri before him did? A media punta essentially is someone who acts as a link between the midfield and attack,someone who can receive the ball with his back to the defence.This role isn’t easy to play and only the players of the highest technical quality can play this role. But Arsene Wenger chose to play him in a deeper role,someone who could feed the wingers.For example against Fulham his average position is deeper than Ramsey’s and almost at the half way point,clearly showing that he isn’t playing the “in between the lines” role anymore. 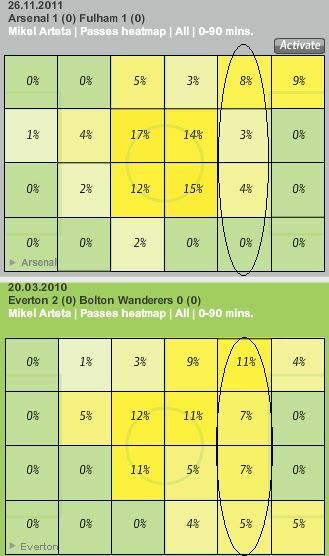 The below chalkboard shows the difference in roles of Arteta when playing for Everton and for Arsenal. So has Arsene Wenger gone back on his philosophy of playing with media puntas,and adopted a more English way of attacking through pacy and skillful wingers?. Maybe,because of the excellent form of Theo Walcott,we may see more of Arsenal’s goals created from the right,but Arsenal’s main source of goals still comes from a media punta,RVP. 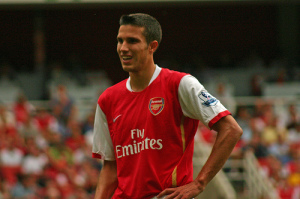 Robin Van Persie is a different type of media punta,he is a false 9 or a nine and a half. 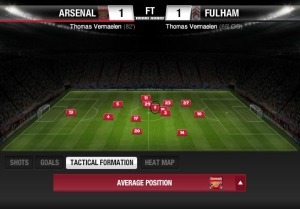 RVP drops back into space to create play,he is one of the few players who can both score and create. This season more and more Premier League teams have started playing a false nine,Rooney,Aguero,Suarez and RVP himself have all both created and scored. One advantage that the False 9 has over the traditional media punta is that he can either choose to play as a normal stiker and score goals,or if he is not getting enough of the ball,he can then drop between the lines and look to create. Fabregas’s move from Arsenal might have made them more solid,as Arteta is a more defensively aware and solid player than Fabregas,Arsenal’s midfield has less chance of being overrun. And with RVP(and Ramsey too) playing the creator’s role with ease,Fabregas’s transfer maybe a blessing in disguise. One can clearly see the change in Adebayor’s playing style, here at Tottenham he looks more determined and wants to get involved in the build up play as well. Coming back to the situation at Arsenal, Van Persie is someone,as we have seen over the past few seasons who is injury-prone. As Arsenal depend on him a lot to create and score,Wenger needs a back up plan. With Wilshere out with injury,Arsene can either play Arteta or Arshavin in the hole with Chamakh/Park up front.Or Else even a 4-6-0 with Arshavin,Arteta and Ramsey switching the striker’s role with each other. Barcelona have already experimented with the 4-6-0 this season,although it has not been very successful,it does make the game tactically more interesting. The La Liga and the Serie A as always have been more attractive and intriguing for lovers of the tactical side of the beautiful game,i hope the Premier League too comes up with it’s share of tactical innovations. If you like our blog,then do vote for us here.